Internal coding languages were different – C-like MQL4 in MetaTrader 4 and C++-like MQL5 in MetaTrader 5. 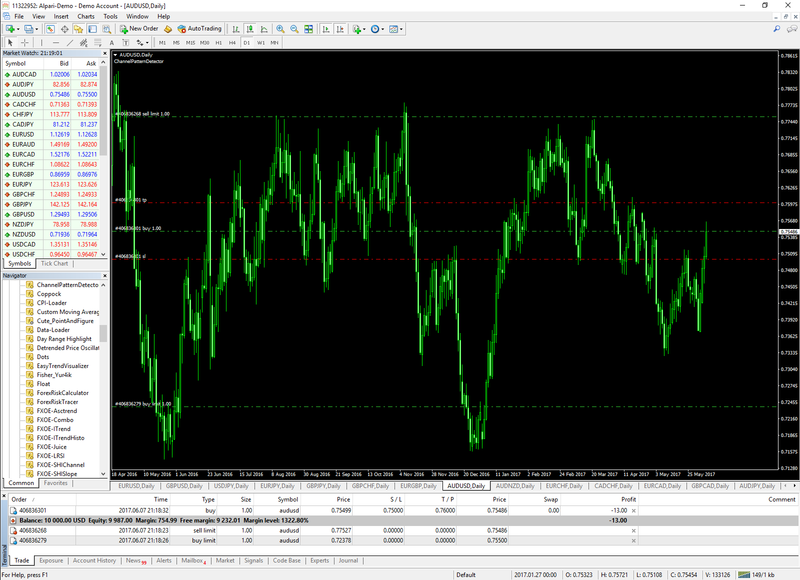 Unlike MT4, in MT5 a trader could hold only one position in one currency pair at a time. You could not hedge positions in MT5. If you sent a Sell order with an open Buy position, the order will close the position rather than open a second position in an opposite direction. It was done to comply with the US FIFO regulation and to reduce the impact of overnight swaps on the traders' accounts. Nowadays, both differences have been mostly removed as MQL4 now accepts MQL5 syntax, and MetaTrader 5 offers hedging accounts. Chart windows – display charts and indicators – this is where you analyze your currency pairs. Market watch – a list of symbols available for trading along with the most current Bid/Ask rates. Navigator – allows navigation through different accounts, custom indicators, scripts, and expert advisors. Terminal – lists open positions, account history, broker alerts, account mail, news, calendar (in MT50, market, signals, code base, all the logs, etc. Free software. You do not have to pay anything. You can download the platform from any MetaTrader broker or from MetaQuotes website, open a demo account via it, and use it for chart analysis even if you trade with a non-MetaTrader broker. Simplicity and customization – there is no terminology to learn, and everything is done in 2–3 clicks. Charts and windows can be customized without any problems by any trader. Ability to create your own indicators and expert advisors. After some basic coding training you will be able to create your own tools that will fit your personal trading style. High popularity means a lot of user-created content. There are thousands indicators and expert advisors written by other traders and available for free download for your MetaTrader. Account history and reports. You can customize your reports and see a good statistical analysis in the standard MetaTrader account reports. Having to install the software. 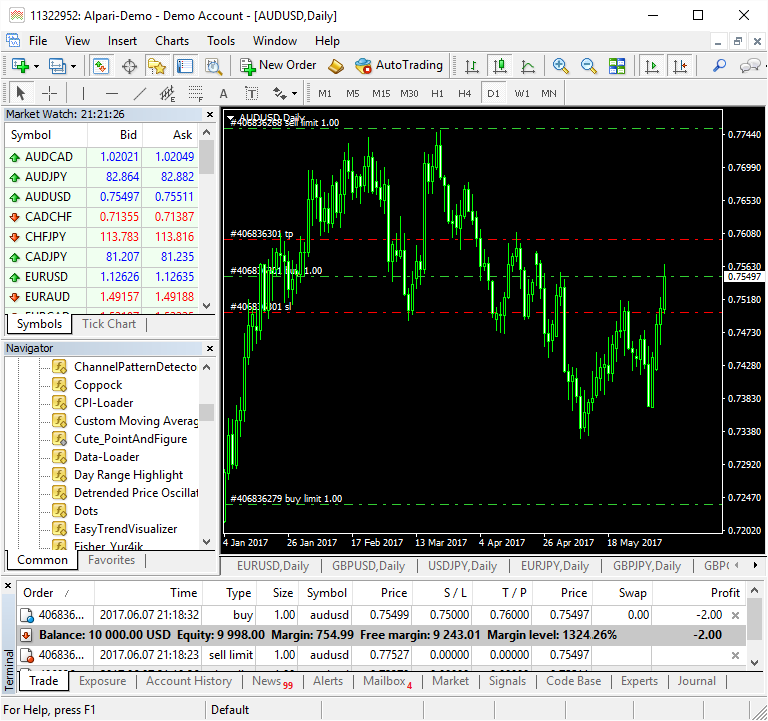 Although it has both web-based and mobile versions, MetaTrader should be downloaded and installed on the trader’s computer to use its full potential – this can be a problem for some people. Many brokers nowadays offer a powerful web-based trading platforms that can be ran online inside the browser without installing anything and offering more features than the web version of MetaTrader. No real support for that user-created software. If you download some indicator or expert advisor, you will not get too much help with it, and using third-party expert advisors may even be dangerous. No "One Cancels Other" orders. You cannot set two orders and tell the platform to cancel one when the other triggers. You can achieve this functionality by creating a custom expert advisor or a script – but that cannot compare to the standard OCO option. Now you know what MetaTrader is and why it is so popular among the Forex traders worldwide. If its advantages attract you, you may want to consider downloading the platform and trying it on a demo account.